Who supervised at Stephen's death? MYSTERY Book of all the books! If the Bible as a whole is the Book that nobody understands, (except the very - "elect"), certainly the REVELATION is the one Book in the Bible least understood of all! Yet this Book is the very key to understanding of all the prophecies! Can it, then, be understood? It can, if you have the key to this Book, itself. We give you, here, this key. 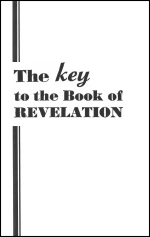 This is not intended to be an exposition of the Revelation - merely a brief outline to give you the key which will unlock its true meaning for you.